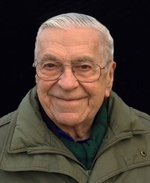 Peacefully at the Ottawa Hospital, General Campus, under the caring staff of the Oncology Department; Adrian passed away on Monday, March 18, 2019, at the age of 87. Beloved husband of the late Katherine (nee Tesla). Loving father of Markian and Olha. Cherished grandfather of Anton and Roman. Dear father-in- law of Craig Perkin. Family and friends are invited to visit at the Central Chapel of Hulse, Playfair & McGarry, 315 McLeod Street (at O’Connor) Ottawa, on Thursday, March 21st from 7-9pm with Panahyda Prayers occurring at 7:30pm. Funeral Mass will be held at St. John the Baptist Ukrainian Catholic Shrine, 952 Green Valley Crescent, Ottawa, on Friday, March 22nd at 11am. Reception to follow. For those who wish, donations to The Leukemia & Lymphoma Society of Canada would be appreciated.